As Jacob Lovingood gets his regular haircut from barber Chester McIntyre at Big J's, artist Warren Harvey removes a painting to make way for a new show. When Natasha Ria El-Scari looked around art galleries in the Kansas City area, she didn't see enough work by black artists. So, El-Scari, an award-winning poet and performer in town, started reaching out to promising young artists to show their work in places owned by black people. Now, El-Scari coordinates rotating exhibits by six artists who show their work in eight area barbershops and beauty salons. She calls the project Black Space Black Art. Natasha Ria El-Scari prices artwork during a recent installation at Big J’s Barbershop in Raytown. The award-winning poet and performer reached out to young artists to show their work in places like barbershops and beauty salons. But the idea has clearly caught on. Johlon Whittaker, who owns Big J’s Barbershop in Raytown, said he enjoys the way each new artist changes the vibe of his space. Jacob Lovingood, who was at Big J's for his regular appointment with Chester McIntyre, said he enjoyed seeing the paintings every time he came in. Artist Warren Harvey takes down another painting from the royal blue walls at Big J's. On that particular afternoon, Lovingood was admiring Warren Harvey’s richly colored paintings of young black men. Harvey said Black Space Black Art has opened new doors for him. 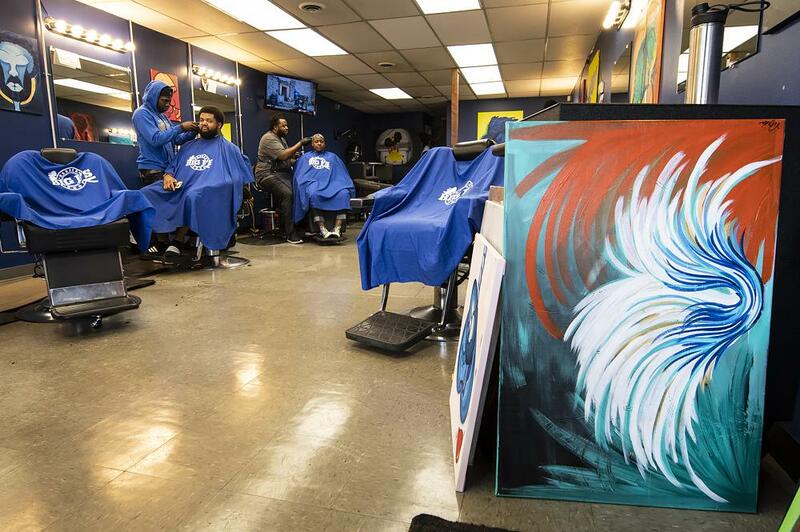 Just a few blocks away at First Cuts Barbershop and Salon, Monique Hall had been enjoying paintings of lions and tigers hung on the lime green walls behind her. An abstract painting by artist Vivian Bluett leans against a wall awaiting installation. But the goal isn’t just for artists to show their work. El-Scari wants them to sell their work. Most salon clients don’t expect to leave the barber’s chair with a piece of art, so El-Scari offered payment plans to make the purchase easy. El-Scari interviews Johlon Whittaker, owner of Big J’s Barbershop, during a Facebook Live gallery opening. But most barbershops aren't open on First Fridays, so El-Scari had to get creative when it comes to art openings. For that, she turns to Facebook Live. If people like what they see, all the work is for sale online. You can experience a Black Space Black Art opening by following along on Facebook. Sometimes, a haircut isn’t just a haircut. When he was growing up in Kansas City, author Derrick Barnes felt like a new kid after visiting his barber. “Man, to get my haircut on Thursday means that when I showed up to school on Friday, I would look so fresh, and people would pay attention to me,” he told host Gina Kaufmann on KCUR’s Central Standard. Spoken word artist Natasha Ria El-Scari is a self-described feminist, educator, and a mother of two. "I've always written out of the expression of love," says El-Scari. "Not out of the expression of pain." But she says she was "urged to do so" by the movement Black Poets Speak Out, which started in response to the events in Ferguson, Mo. The first poem in Natasha Ria El-Scari’s Screaming Times launches a new war on a lie 397 years in the making.